My name is Czar, and in the US, czars are generally executive branch officials appointed by the President either with Senate approval or without. Czars have various working titles such as advisor, director, administrator, or diplomatic envoy, but such titles are often long or awkward sounding, so they go with Czar. And that’s why I have my name. It’s because it would be awkward and a mouthful if my name represented all of the things I am, like big, energetic, sweet, loyal, active, sensitive, 2 years old and a Doberman Pinscher. Could you imagine if that was my name!? 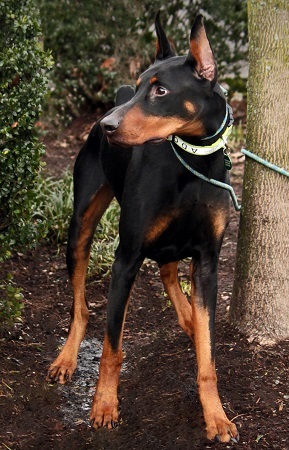 Bigenergeticsweetloyalactivesensitivetwoyearsolddobermanpinscher, last name of idon’tlikecats? That’s a mouthful and very difficult to pronounce! So, that’s why they call me Czar- it just kinda encompasses all of the things I am. I’m also vaccinated, microchipped and neutered. So, what do you say? Can I be your Czar?? Fill out an application at pixieproject.org so we can schedule a meet and greet. My adoption fee is $350.